The past two weeks involved hands on work that I was able to do on the rehousing project of our naturally preserved mummy. 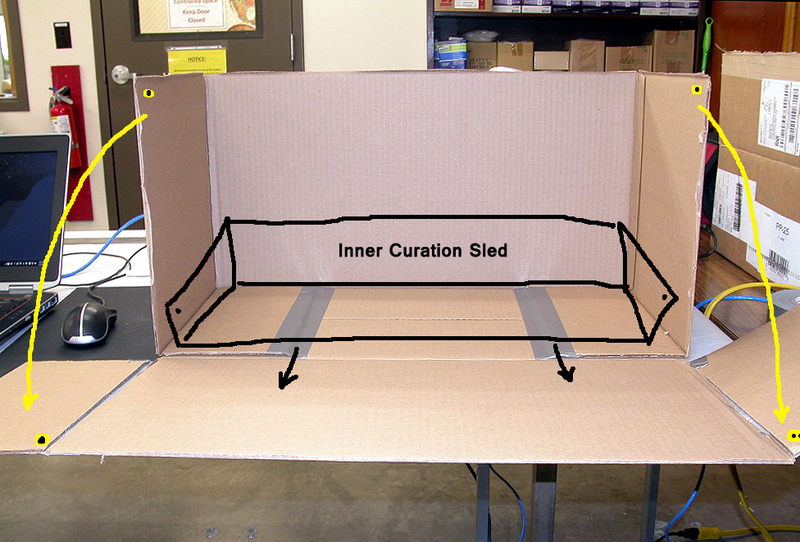 Working with cardboard boxes, duct tape, and other tools, I was able to come up with my first rough idea for both the outer box and inner sled. Upon further work, both Kerri and I decided that an additional inner sled would be needed. Hope to keep you all updated as we make more progress! Truc has been busy constructing models of the long-term mummy housing. She is experimenting with different types of boards, tapes and designs to better understand how viable her design will be. The materials that she will be using in the design of her final project will be archival, chemically inert and offer the rigid support needed to protect such a delicately preserved individual. 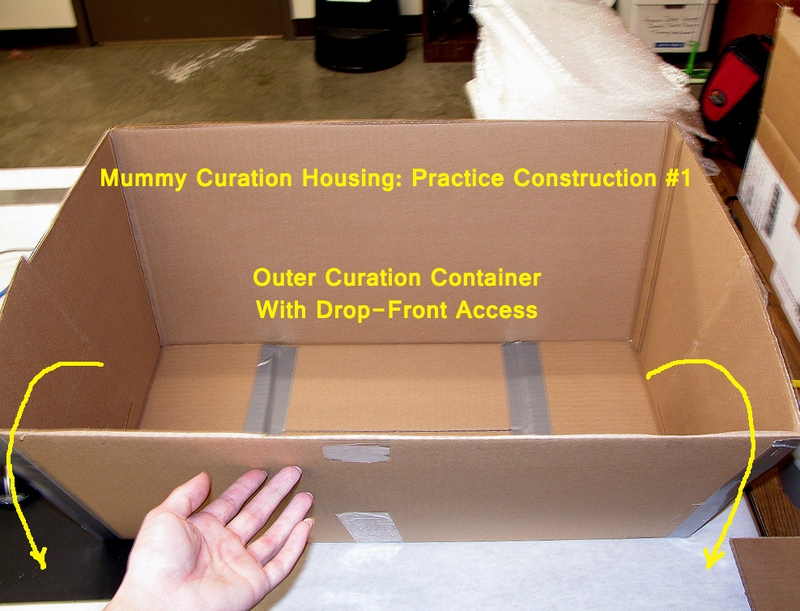 Once she decided on a drop-front outer box that will provide the rigid protection necessary for moving the mummy she focused on a designing an interior sled with handles. This will allow researchers to access the remains by untying the stays and dropping the front of the box and then sliding forward the interior sled. 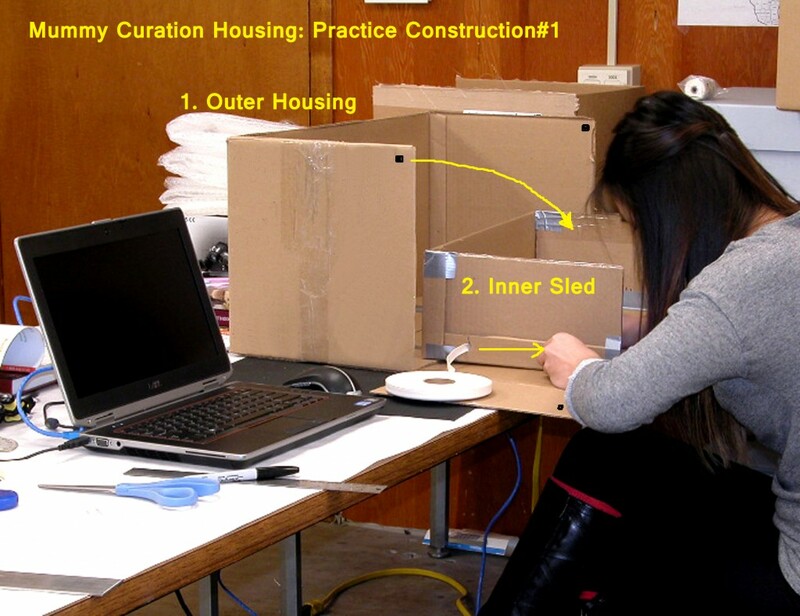 Truc’s project is intended to improve the stability, protection and access of one of our most sensitive sets of remains. 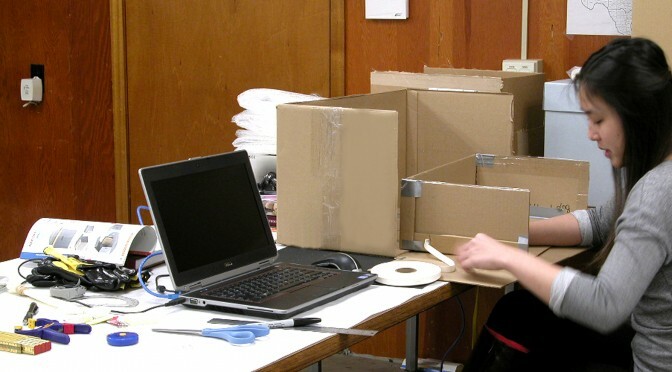 Designed much like a set of Russian nesting dolls, the various envelopes will provide 1. the rigidity necessary to move the box when necessary, 2. the ability to access approximately 160 degrees of the remains, and ultimately 3. 180 degrees with the insertion of a flat, reinforced platform with custom-contoured ethafoam supports that will prevent the mummy from turning or leaning. Check back later in the week as Truc continues to design and engineer protective long-term housing for this delicate set of remains as she continues her research into best practice for creating stable, preservation micro-environments for organic objects. Previous PostOf Snips and SnailsNext PostExplore UT 2015: A Success!